Despite its structure and appearance, a leaf can be mighty. Imbue one with meaning and it can transform into an emblem of pride, tradition and scholastic standards achieved. 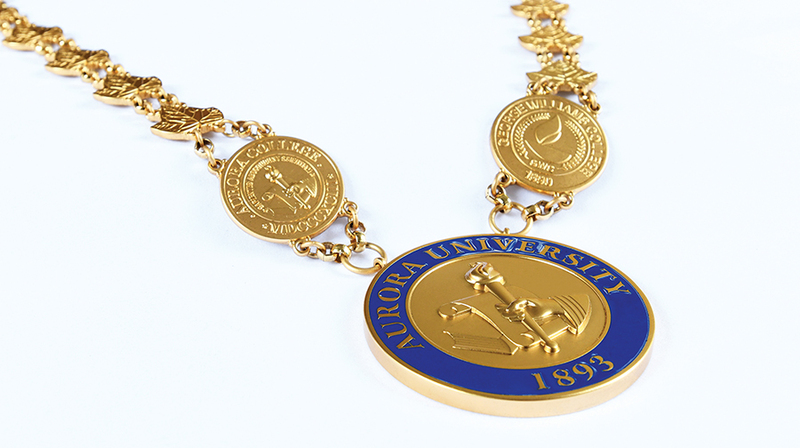 Aurora University has a new presidential chain that prominently features gold ivy leaves. Early in the 20th century, professor of Greek and Latin John W. Beach suggested that ivy leaves growing on the outside of Eckhart Hall could be awarded to students showing exceptional academic achievement each semester. In 1932, Aurora College created the Gold Ivy Leaf Award. 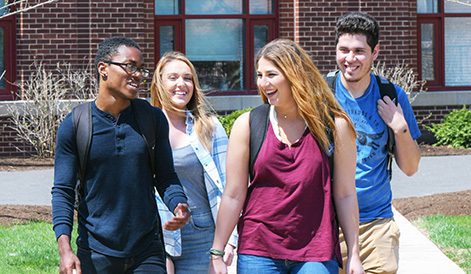 The tradition continues today as the university recognizes its most outstanding students each spring at the Honors Convocation. Three medallions tell the story of Aurora University. One features the Aurora College seal and another the George Williams College seal. There are striking similarities to the two emblems. One features a torch and the other a lamp of learning, powerful testimony to our understanding that education is a source of illumination and truth. This is what we mean when we speak of the “transformative power of learning.” The two college seals find their final expression in the new Aurora University emblem encircled with our signature AU blue. Many of our academic traditions have their origins in the Middle Ages. In 15th century England, royalty bestowed such decorations as a form of recognition. In higher education, presidential chains and medallions — together known as livery collars — indicate that the wearer is the highest office holder at institutional ceremonies.